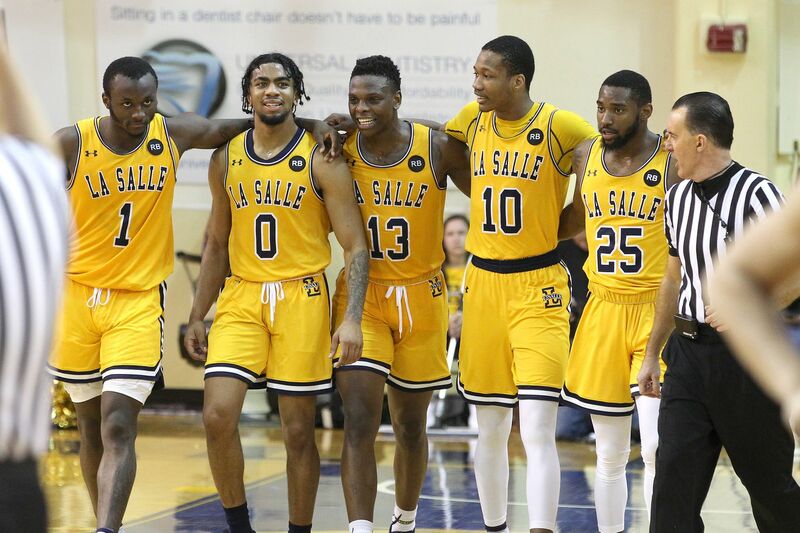 La Salle's David Beatty (left), Pookie Powell, Saul Phiri, Isiah Deas and Tracy Carter late during their win over St. Joe's on Feb. 5. FAIRFAX, Va. — Pookie Powell had 18 points and six assists, but it was not enough as La Salle saw its four-game winning streak snapped, as the Explorers fell to George Mason, 84-76, on Sunday at EagleBank Arena. Powell led five players in double figures for La Salle (7-15, 5-5 Atlantic 10). Saul Phiri hit five three-pointers on the way to 17 points. Traci Carter and Isiah Deas scored 12 each, and David Beatty scored 11 off the bench. Javon Greene had a career-high 21 points to lead the Patriots (14-10, 8-3). GMU got off to a fast start, opening up a 13-4 lead at the 14:50 mark, but the Explorers tightened the game and went on a 9-0 run that helped put them on top at 18-17. La Salle finished the first half strong, scoring the final eight points and heading to the locker room at intermission with a 39-37 lead. George Mason quickly regained the lead to begin the second half, as Greene and Jarred Reuter scored early layups. With 3:12 left and GMU leading by 78-71, Phiri hit a three-pointer and and Powell came up with a steal on the Patriots’ ensuing possession. After a timeout, freshman Ed Croswell hit a baby hook in the lane to pull La Salle to within two, but the Explorers missed their final four shots, while the Patriots sealed the win by going 4-for-4 from the foul line that left them 21-for-24 overall from the line. La Salle was 9-for-11 in free-throw shooting. The Patriots outrebounded the Explorers, 36-23, including 10 offensive rebounds. The Explorers will next play 7 p.m. Wednesday against Duquesne at Tom Gola Arena.